Nine Plus has been on the cutting edge of performance rear end technology since it's inception. 9+ Racing Gear Oil - Oils high-shear polymers maintain a consistent film on gear surfaces to decrease heat build-up and improve performance and reliability. Axle Tube Alignment Tools from DragPartsUSA>com allow for accurate installation of axle tubes into Ford 9" rear end housings. Axle Tube Tools are utililzed for accurate installation of axle tubes in either Ford 9" or Quick Change rear ends. Check out the Recently Listed Brake Systems. Pit Stop USA is The Online Motorsports Superstore! We feature Housing Line-Up Fixtures at low everyday prices. Pit Stop USA is The Online Motorsports Superstore! We feature Housings Ends at low everyday prices. Pit Stop USA is The Online Motorsports Superstore! We feature Leaf Spring Brake Pads at low everyday prices. Pit Stop USA is The Online Motorsports Superstore! We feature Pinion Supports at low everyday prices. Pit Stop USA is The Online Motorsports Superstore! We feature Rear End Bolts, Nuts, Washers at low everyday prices. Pit Stop USA is The Online Motorsports Superstore! We feature Rear End Cover Gaskets at low everyday prices. Pit Stop USA is The Online Motorsports Superstore! We feature Rear End Housings at low everyday prices. Pit Stop USA is The Online Motorsports Superstore! We feature Rear End Tools at low everyday prices. Getting the suspension geometry right during fabrication is critical to handling, and PitStopUSA.com has a great selection of shock mount brackets to help you get the job done right. Weld on or bolt on shock mounts in a new location or replace one that broke. Clamp ons are usefully for testing a shocks placement before welding it in place. Steel Axle Tubes from PitStopUSA.com are made of 1026 D. O. M. steel tubing and are suitable for up to 63" wide assembly. 9+ Plus Ford 9" Axle Tubes (Pair) - 1026 D.O.M. Steel Tubing - 21" Length - Up to 63" Wide Assembly - 3" x .188"
9+ Plus Housing End T-Bolt - 3/8"
Nine Plus - 9+ 1/2-20" Thread T-Bolt Steel Black Oxide Backing Plate - Ford 9"
Nine Plus - 9+ 3/8-24" Thread T-Bolt Steel Black Oxide Backing Plate - Ford 9"
Pit Stop USA is The Online Motorsports Superstore! From Nine Plus housing centers, housing ends, and housing tube kits, to gears cases, pinion supports, & yokes, to complete brake kits all 9+ parts are 100% new! The Track 9 line features heavy duty housing that have been made famous in NASCAR racing. These housings are available in lightweight versions for weight conscious competitors, standard steel units, and stainless steel units. 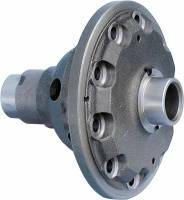 Nine Plus Housings and covers are formed from high tensile steel. Nine Plus has been on the cutting edge of performance automotive rearend technology since it's inception. 9-Plus products are brand-new manufactured assemblies and components, not junk yard rebuilds. All 9 Plus components meet or exceed original O.E.M. specifications. They are made of superior materials, like cast-iron nodular housings....and are precision machined for exact fit. We feature Nine-Plus Track 9 Housings, Nine Plus Heavy Duty Housings, 9+ Axle Tubes, 9 Plus Alignment Bar Fixture, 9-Plus Large Bearing Housing Ends, Nine-Plus Ford 9" Housing, Ford 9" Housing Flange, aSportsman Casea, aRace Casea, Limited Slip Differentials, Pinion Supports, Replacement Yokes and Ford 9" Housing Accessories like Leaf Spring Pads, Shock Absorber Mounts, Housing Studs, Housing Gaskets and Nut and Washer Packages at low everyday prices!